Ever since Ed Brubaker took over Captain America the Revolution has ranked this comic consistently in our Top 5 favorite titles each and every month. Captain America is one of the comics that I read that I just can’t wait until the next issue. And that is impressive considering I have never liked Captain America before Brubaker took over this title. Synopsis: The issue starts with an A.I.M. scientist asking Captain America and Sharon to help A.I.M in defending their lab under the small town in Iowa against the attack from Crossbones and Sin. The A.I.M. scientist also tells Captain America that they were attacked earlier by a man fitting Bucky’s description. On their way to the lab, the A.I.M. scientist tells Captain America that since the Red Skull died, various branches of A.I.M. have been breaking off and taking their research with them. On of them is called R.A.I.D., Radically Advanced Ideas in Destruction. They arrive outside the lab and Sharon calls for a S.H.I.E.L.D. strike force. Inside the lab Crossbones and Sin tell the A.I.M. troops to get ready for an attack by S.H.I.E.L.D. We then see Captain America and his team enter the lab and immediately get attacked by Crossbones and his A.I.M. troops. And with that it is a braaaaawwwwwwl! During the fight, Sin activated a Modoc Squad who begin to attack everyone. Sin gets Crossbones and they decide to flee and let S.H.I.E.L.D. deal with the rampaging Modoc Squad. Captain America then opens up a huge can on the Modoc Squad. After the fight, Sharon tells Captain America that after all these years he has never told her how he dodges bullets. Captain America answers “Oh, that’s nothing…I just see faster.” Great answer. During the clean up after the fight, Sharon tells Captain America that nothing was stolen from the A.I.M. weapons vault and that one of their agents is missing. They don’t know why Crossbones wouldn’t steal anything from the vault and kidnap one of their agents. We then cut to a small country house where Captain America and Sharon pay a visit to Betty Tolin. Her mother was Gretchen Zeller and was a resistance fighter in Germany. Captain America and Bucky fought with her. Bucky fell in love with her. Betty told Captain America that Bucky had paid her a visit and he thought he was a bit crazy. She told Captain America that Bucky wanted to know where Gretchen was buried so he could pay his respects to her before it was too late. Sharon and Captain America leave and during the car ride, Captain America tells Sharon that it is too convenient that Bucky tracks down someone who immigrated in the 1940’s and changed their name and then just stumbles across an A.I.M. lab. Captain America says that Nick Fury must be feeding Bucky the information. Captain America thinks that Bucky wanted to pay his respects because he is going to try to kill Lukin and he doesn’t plan to survive the attack. We then cut to Crossbones torturing the captured S.H.I.E.L.D. agent in an attempt to discover who killed the Red Skull. The agent tells Crossbones that the killer was Lukin. Crossbones then kills the agent and tells Sin that Lukin is a dead man. End of issue. The Good: I cannot praise Ed Brubaker’s writing enough. It is amazing how he consistently puts out entertaining issue after entertaining issue. He is so consistent it is amazing. Captain America #17 is yet another great issue. I like the team of Crossbones and Sin. They are totally despicable and make for a pair of nasty villains that you love to hate. Are they both one-dimensional stereotypical villains? Yes. But, Captain America has always been plagued by that type of villain and Crossbones and Sin are still entertaining and easy to hate. I like the fractionalizing of A.I.M. into different competing groups now that the Red Skull is dead. It is the only natural outcome to Red Skull’s death. What will be interesting is who will be the man to unite A.I.M. once again at some point in the future. I love how Brubaker is handling Bucky. He is keeping Bucky in the shadows. We don’t really see much from him other than in flashbacks or in witness accounts of what Bucky did. You only hear what he says or has done through people who have seen him or spoken with him. I think that is perfect. Bucky should remain almost an “urban legend.” A true shadow operative. You hear about him. You see the aftermath of where he has been. But, you never actually see him. I hope Brubaker keeps Bucky that way for as long as he can. The new storyline is going to center around the race for Lukin. 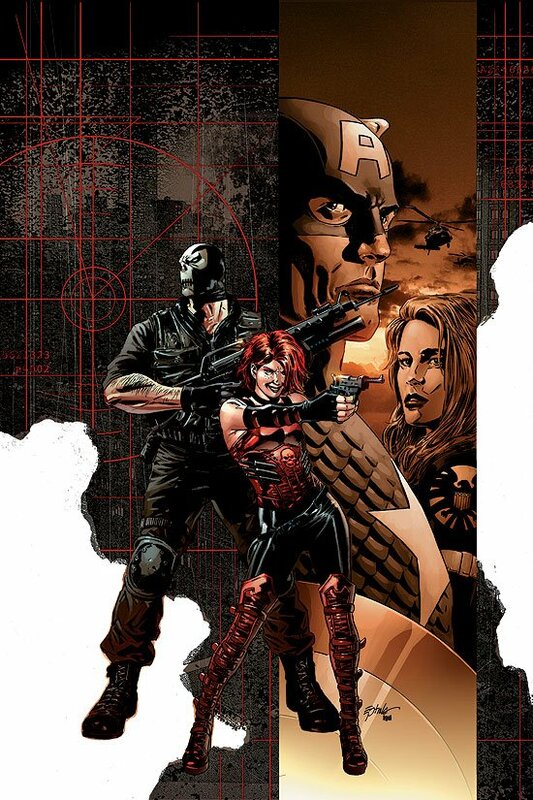 You have Bucky fueled with information from Nick Fury looking to kill Lukin for manipulating him, you also have Captain America and Sharon looking to find Lukin in order to find Bucky and you also have Crossbones and Sin looking to kill Lukin for killing the Red Skull. I’m interested to see how this mad race to Lukin plays out. Mike Perkins has replaced Steve Epting as the artist on Captain America. I am really bummed about that. I absolutely love Epting’s art on this title. His gritty and dark style fit Brubaker’s story perfectly. Having said that, Perkins did a nice job on this issue. His art also fits the tone and style of Brubaker’s story. The Bad: I have no complaints at all with the writing. Brubaker is doing an excellent job on Captain America crafting one exciting story after another. I do miss Steve Epting’s art. Is Perkins’ art as strong as Epting’s art? No. Epting is better. Perkins’ art is a little inconsistent. Some panels look good while others look terribly weak.